Lenny was a one time member of the Schlierachtaler Stamm and would go on to found a Gau-NA member Verein called D'Heimatsgruppe of Bergen, NJ. 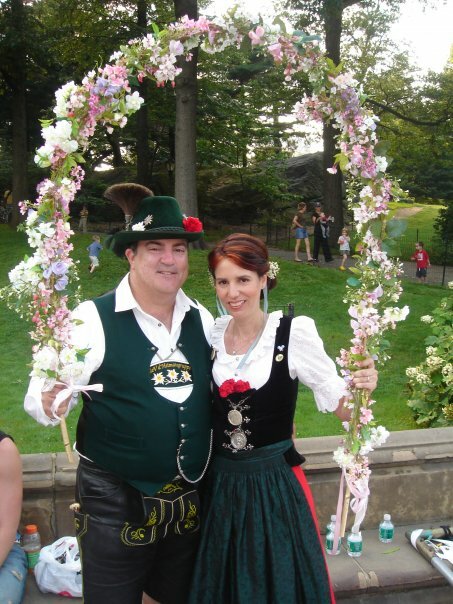 Lenny was active in the New York/New Jersey German-American community including as Director of the German-American Committee of Greater NY, Executive Committee member of the German-American Steuben Parade New York, and Chair of the public relations committee. He fought a two-year battle with pancreatic cancer and was still working for the parade up till the end. Gauverband Nordamerika sends its deep condolences to his family and friends. Ruhe in Frieden. 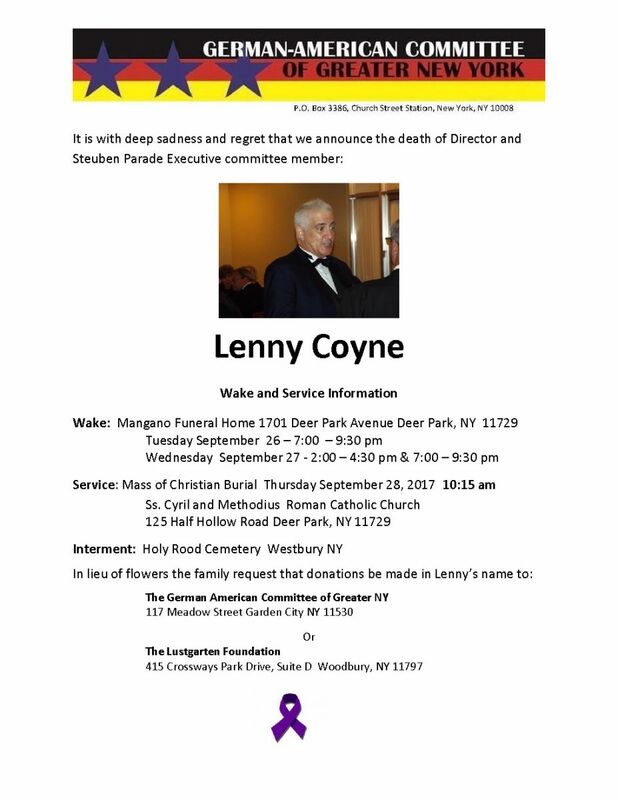 Lenny Coyne has left our world, but we will never forget him. Lenny was born in New York City, and raised in Puerto Rico. He had a varied background, growing up listening to a mix of Broadway soundtracks, Beethoven, Johnny Cash, and the Fania All Stars. Lenny was an excellent trumpet player at a young age. He was a teen-aged star in the Old San Juan Jazz Band. He also played varsity basketball during his freshman year in high school. His deep theological upbringing included the Roman Catholic, Wesleyan, and Byzantine traditions, art, and music. Lenny's first exposure to German culture was through his dad, Tony, who was a fluent German speaker and a lover of all good things Deutsche. Later Lenny would meet his lovely wife, Barbara, under an Oktoberfest tent, and the rest is history! Lenny loved all things Disney. He and Barbara had a Fairy Tale Wedding in Disney World in 1998. They often took their friends and family on trips to the Magic Kingdom. Lenny was able to merge the beauty and depth of German traditions with the sheer fun and excitement of the Disney experience; the movie Enchanted is an excellent example. Within a few short years he earned the trust and love of many members of the New York and the national media, earning his beloved German-American Steuben Parade the publicity it so much deserves and taking the U.S. National Masskrugstemmen Championship in Central Park to where it is today. Lenny loved to include as many of his friends and traditional groups in all of the events which he promoted. He mentored, he taught, and he encouraged for no personal gain other than the joy of helping another. Lenny, you are and always will be: A Leader, Optimist, Master of Ceremonies, producer, Promoter, storyteller, caretaker, animal lover, devoted husband, son, brother, uncle, nephew, cousin, friend, Adventurist, performer, jokester, Lover of all things Disney, "The Buzz Lightyear," and schuhplattler. An unbeatable zest for life, kind, gentle, lighthearted goodness. Always the first to hit the ground running and never look back. Larger than life. Keeper of the light. Once on board, you gave your all and were all in. You will truly be missed. You are George Bailey!